A new look at the interstellar dust permeating the universe has revealed hints of organic matter that could be created naturally by stars, scientists say. Researchers at the University of Hong Kong observed stars at different evolutionary phases and found that they are able to produce complex organic compounds and eject them into space, filling the regions between stars. The compounds are so complex that their chemical structures resemble the makeup of coal and petroleum, the study's lead author Sun Kwok, of the University of Hong Kong, said. "What impressed me most is that complex organics are easily formed by stars, they are everywhere in our own galaxy and in other galaxies," Kwok told SPACE.com in an email interview. "Nature is much more clever than we had imagined." The findings of the new study were published online by the journal Nature. Kwok and his colleague Yong Zhang, also of the University of Hong Kong, studied a set of well-known but mysterious infrared emissions found in stars, interstellar space and galaxies. These phenomena, which are collectively called Unidentified Infrared Emission (UIE) features, have been known for 30 years, but the exact source of the emissions has not been pinned down, and remains a broad assumption. 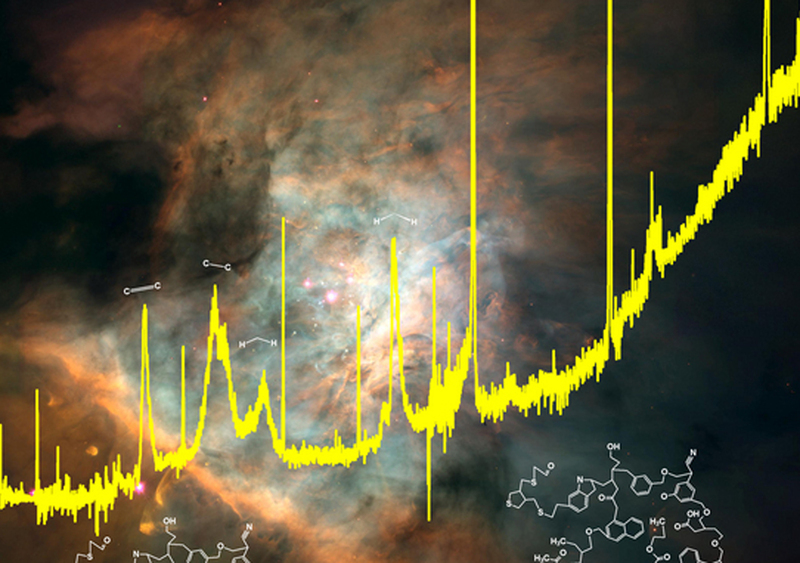 Kwok and Zhang analyzed data from the European Space Agency's Infrared Space Observatory and NASA's Spitzer Space Telescope to show that the Unidentified Infrared Emission features are not emitted by PAH molecules because the emissions have chemical structures that are far more complex. "I have been suspecting this for many years," Kwok said. "Now we think we have the evidence." The researchers observed stars at different phases of stellar evolution — first low- to medium-mass stars, then stars in the protoplanetary nebula phase, which is a short-lived episode during a star's rapid evolution, and finally stars in the planetary nebula phase, which is characterized by an expanding shell of ionized gas that is ejected by certain types of stars late in their life. Kwok and his colleague found that characteristics of the Unidentified Infrared Emission features could not be detected in low- to medium-mass stars. But, the astronomers found that the emissions began to appear in stars in the protoplanetary nebula stage and grew stronger as the stars matured into the planetary nebula phase. "We therefore know that these organics are being made in the circumstellar stellar environment," Kwok said. Another surprising thing they found was just how quickly stars were generating complex organic compounds and ejecting the dusty material into their surrounding environment. "Since we know their dynamical and evolutionary ages of these objects (dynamical age is how fast the nebula will disperse, and evolutionary age is how fast the star is evolving), we can put constraints on the chemical time scales," Kwok said. "Since the dynamical/evolution ages are of the order of thousands of years, the appearance of the spectral features suggests that the organic compounds are made on time scales shorter than thousands of years." The researchers also studied emissions from exploding stars and found that these dynamic cosmic events produced dust even more rapidly. "Their spectra changed from a pure gas spectrum to a dust spectrum on a matter of days or weeks," Kwok said. "The sudden appearance of the features suggests that organic dust can be made extremely quickly." But, the findings throw a wrench into existing theories that posit that stars cannot produce such complex organic compounds in the near-vacuum environment of space. "Theoretically, it is very difficult to understand because of the very low density of the circumstellar environment," Kwok said. "But, observationally, there is no doubt as we see these spectral features appearing and changing on very short time scales. This means that these organic solids are condensing directly from the gas phase." The scientists also found that the chemical structure of organic star dust is similar to complex organics found in meteorites. Since meteorites originate from space rocks that are remnants of the early solar system, the results of the study suggest that stars could have enriched the early solar system with organic compounds, Kwok said. "It is quite possible that the organics in meteorites are remnants of star dust in the solar nebula," he explained. "The star dust [was] ejected by nearby planetary nebula[s] and survived the journey across the galaxy." Early in the Earth's formation history, the planet was pummeled in a shower of meteorites and comets during a period known as the Late Heavy Bombardment. Since the organic compounds in meteorites are similar to what was found in stellar dust, the results of this new study show that the barrage of meteorites that fell to Earth during the Late Heavy Bombardment could have carried organic star dust. "If this is the case, life on Earth may have had an easier time getting started as these organics can serve as basic ingredients for life," he said. Further research in this area will be necessary, and Kwok intends to continue analyzing additional infrared observations to better pin down the chemical structure of organic star dust. He is also interested in studying more about how and why stars are able to produce complex organics as quickly as they seem to. "Coal and kerogen are products of life and it took a long time for them to form," Kwok said. "How do stars make such complicated organics under seemingly unfavorable conditions and [do] it so rapidly?"